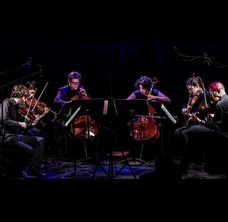 American Contemporary Music Ensemble :: TicketServices.gr " // + "
The renowned American Contemporary Music Ensemble (ACME) presents a unique selection from John CageΆs Fontana Mix, honoring one of the most important American composers of the 20th century. ACME, which has risen to world prominence thanks to the virtuosity, passion and commitment with which it performs and champions American composers, as well as its combination of classical and rock sounds, will deliver a high quality artistic performance for the audience of Summer Nostos Festival. The concert will also feature American composer and sound designer John Bennet. Bennet's work has been featured in short and animated films, which have been screened at international film festivals, including the Sundance Film Festival, International Film Festival Rotterdam, London International Animation Festival and ESPTV, with great success. Special appearances will also be made by mezzo soprano, Anna Pangalou and composer Christina Vantzou, who has become known for her subtle and dissociative approach towards the concept of time in her performances.